We truly enjoyed this recipe,we use bison often and have never used yogurt in a meatloaf before,I used Greek instead of regular,it was superb.Butternut and Brussels were a great side with this also,this was a wonderful fall dish.Hats off! Heat oven to 375 degrees. Sauté the celery, carrots, and onion until soft and lightly browned. 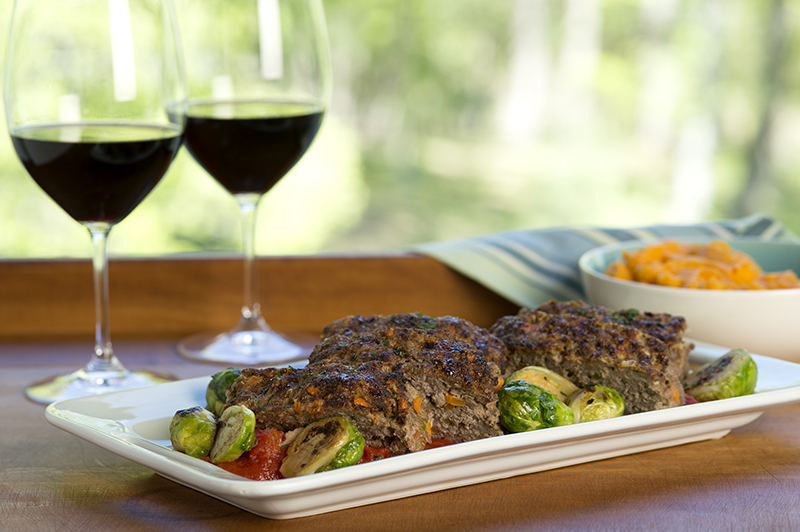 Cool slightly and gently combine with remaining meatloaf ingredients. Pat mixture into a traditional bread loaf pan or shape by hand and place onto a sheet pan. Cook in oven for 45 minutes–1 hour to an internal temperature of 160 degrees. Pour sauce over meatloaf and let stand 10 minutes before slicing. Combine the tomatoes, broth, and vinegar in a small sauce pan over medium-low heat. Simmer, adjusting heat as necessary about 30 minutes or until tomatoes break down into a sauce. Season with salt and pepper. Cook diced butternut squash in 2 quarts of boiling water until easily pierced with a knife, about 20 minutes. Drain, return to sauce pot and add milk, butter, and salt and pepper. Mash well, stir in sherry vinegar, and reserve in a warm area. Preheat a heavy-bottomed sauté pan or skillet over medium-high heat. Add olive oil and Brussels sprouts to pan and season with salt and pepper. Cook about 8 minutes or until browned and almost tender. Add garlic and cook another minute before adding 1/3 cup water. Cook about 2 minutes or until water is evaporated. Remove from heat and season with lemon juice.